My latest three reads are pictured above. 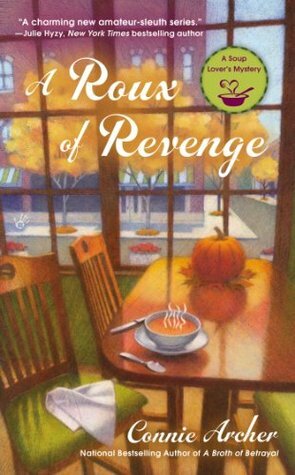 A Roux of Revenge is the third book in the “A Soup Lover’s Mystery” by Connie Archer. Lucky is busy running her business, hosting a pumpkin carving contest, and attempting to sort out the family problems of young employee, Janie and her mother, Miriam. In the midst of all this, a fair is being hosted in the town by a somewhat sleazy businessman, a murder occurs of a mystery man, and details of an old unsolved robbery surface. There is lots of action that certainly pushes the plot along in this outing of the series. Lucky is a great character and the other recurring characters continue to be fleshed out as the series develops. The mystery plot is interesting with a few red herrings to throw the reader off the trail. There is also an interesting romantic subplot with Lucky that is explored more than it was in previous books. I thoroughly enjoyed A Roux of Revenge and look forward to the next book in the series. Written in the Blood by Caroline Graham is one of the books that the Midsomer Murders TV series is based on with the wonderful Inspector Barnaby as the sleuth. This was actually one of my favorite episodes of the TV show. A writers group’s invitation to a well known author to speak leads to murder and old secrets springing forth. The members of the writing group are an eclectic bunch from a woman writing her family history, to a college professor who does improvisational work and a kind of poetry, the professor’s wife with a children’s book about a dragon and others. There are many secrets that come to light before the murderer is finally exposed. A really well done English village mystery which includes a colorful cast of characters, a lovely setting, and an intelligent, admirable sleuth. 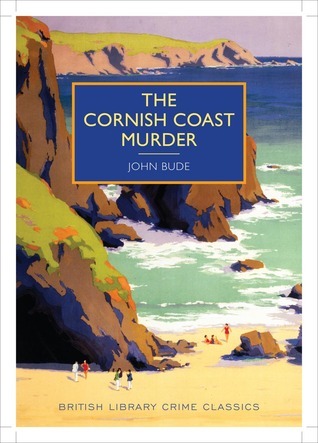 The Cornish Coast Mystery by John Bude is a British Library Crime Classic. It is part of a series of crime novels from the British golden age of crime writing that are now being republished after almost disappearing from sight. This was an engaging read right from the first chapter. The Vicar earns not only the Inspector’s respect but the reader’s as well. His methodical approach to solving the crime and following the clues shows intelligence and insight. The interest in this book is in the details. The details show the difference between reading a book that written in the past and reading a modern day historical fiction. The scene is established vividly through the details. The red herrings are supported by evidence to lead the reader along enough to be convincing. The author employs a technique that I know I have seen in current mystery novels and I am curious whether he was the first to try it. I don’t want to say more because it is an integral part of the plot. I am certain I will enjoy reading more work by John Bude and more of the British Crime Classics in general.